Dog Money Three-Day Valentine’s Menu! Come join us Thursday the 14th, Friday the 15th, or Saturday the 16th, where couples will enjoy our special menu items including glass of Champagne, and a long stem rose for the lady. Entrée specials include Basil Pesto Farfalle Pasta with Grilled Chicken Breast ($17), or Surf & Turf Bacon-wrapped six-ounce filet with grilled shrimp, mashed potatoes and Hericot vert almandine ($30). 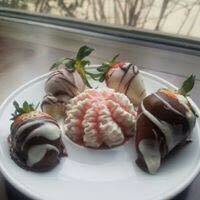 Special Dessert offering of Fresh Chocolate-Covered Strawberries with white chocolate striping ($6). Reservations recommended. See you and your special someone here!